(born 21 February 1950) is a Swedish author and teacher who has written a number of successful novels, mostly crime fiction. He has won Best Swedish Crime Novel Award three times, and his novel Carambole won the prestigious Glass Key award in 2000. His books have been translated from Swedish into more than twenty languages. 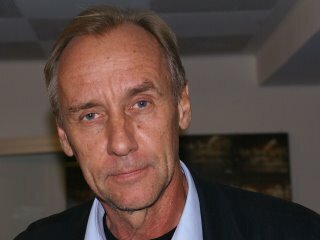 Håkan Nesser was born and grew up in Kumla, Örebro County. His first novel was published in 1988, but he worked as a teacher until 1998 when he became a full-time author. A recurring main character is called Van Veeteren, a detective in the early novels and later the owner of an antique books shop. With his 2006 crime novel Människa utan hund Nesser introduced a new main character, Inspector Gunnar Barbarotti, a Swedish police inspector of Italian descent. He has remained the main protagonist in Nesser's crime books since then. Barbarotti is a more upbeat character than Van Veeteren and the books are firmly set in Sweden, although the town of Kymlinge is fictitious and named after an "abandoned tube station" in Stockholm.